What’s happened to the idea of the compact city? Pending completion of the Government’s new urban strategy for Melbourne, the two major strategic planning documents that jointly guide the metropolitan area’s development – Melbourne 2030 and Melbourne @ 5 Million – are rich with rhetoric about the importance of directing development to established suburbs rather than the periphery. They also emphasise the desirability of concentrating that development around activity centres instead of dispersing it throughout the existing suburbs. In a show of great political courage, Melbourne 2030 sought to limit the share of Melbourne’s population growth in peripheral Greenfield developments to just 38%. Virtually all the rest would be located within the established suburbs, of which 40% would be concentrated in activity centres. However the supplementary strategy released six years later in 2008, Melbourne @ 5 Million, relaxed the target considerably. It was clever – it slackened the numerical target to 47% while simultaneously narrowing its geographical ambit to just the six Growth Area municipalities. These six cover an area much smaller than that implied by the term ‘greenfield’ used in Melbourne 2030. This statistical report prepared by the Department of Planning and Community Development (DPCD), Housing Development Data 2004-2008, reveals that the new Melbourne @ 5 Million target wasn’t very demanding. It merely echoed the way the market had behaved over the preceding four years. Over 2004-08, the Growth Area municipalities accounted for 44% of net new dwelling construction (after subtracting demolitions). Once the larger average household size of outer suburban households is taken into account, this is much the same as Melbourne @ 5 Million’s 47% population “target”. Rather than seek to change the market as its rhetoric suggests, Melbourne @ 5 Million was essentially business as usual. In any event limiting the target to Growth Areas could be construed as misleading. They are not the same as the outer suburbs. There was considerable growth in other peripheral municipalities over 2004-08 e.g. Frankston, Nillumbik, Mornington Peninsula and Yarra Ranges. When they are added to the Growth Area municipalities, the outer suburbs accounted for 54% of all new dwelling construction in the metropolitan area over 2004-08. In terms of the share of population growth, the number would be somewhat higher. So Melbourne @ 5 Million essentially had no real ambition to drive significantly higher housing supply in the established suburbs. Despite what the text sought to imply, it settled for them absorbing just 46% of new dwellings. Melbourne @ 5 Million also dropped any numerical targets for activity centres. Previously, Melbourne 2030 projected that 40% of the population growth within the established suburbs would be concentrated at relatively high densities, with the other 60% in small infill developments dispersed across the suburbs. The DPCD report suggests why these numerical targets might have been dropped. It shows that 76% of new dwellings constructed in the middle ring suburbs over 2004-08 were in projects with fewer than 10 units, with the great bulk towards the smaller end of this range. Only 18% of dwellings were in developments with 20 or more units. These estimates do not account for demolitions. The inference is activity centres in the middle ring suburbs were not attractive places to build new dwellings (this is in stark contrast to the inner city – and especially the City of Melbourne – where 82% of new dwellings were in projects of 20 units or more). I’ve cited other evidence before supporting the conclusion that suburban activity centres aren’t attracting new housing on anything like the scale envisaged in Melbourne 2030. Thus it appears that very small projects are carrying the burden, as modest as it is compared to cities like Sydney, of increasing dwelling supply in the middle suburbs. Limited supply means fewer people who prefer a more central location – and who are prepared to accept a smaller dwelling for the privilege – can afford that option. 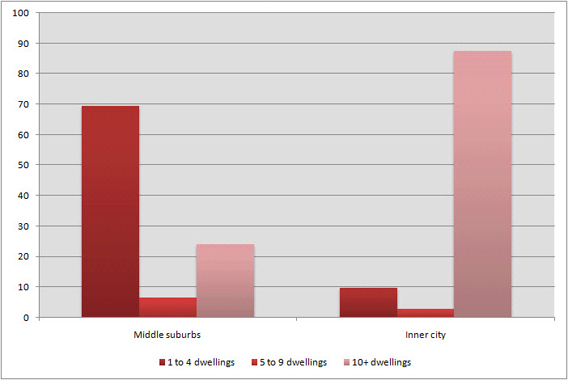 Those who might like to live within a middle suburban activity centre have even fewer options. Next time I’ll look at where the smaller suburban projects are locating within the middle suburbs.